MASS START: gaps in seconds after the cross country event are converted in points which are then added to the points of the jump. Todd Lodwick called it a day on a great career in 2006 only to find new inspiration on the sidelines before returning to the world of Nordic combined and exceeding all his previous achievements in a staggering comeback. The newly crowned 2009 double world champion has put reputations aside to build his way back into what is now a very strong American team, as they get set to bid for what would be a first ever Olympic Nordic combined medal at Vancouver 2010. Lodwick's return is the stuff of fairytales, after he quit competition following a miserable performance at the Turin Games before convincing the US team to give him the opportunity to mount his comeback. "I finished my career without achieving a goal of mine," he said of his dream to get on the Olympic podium. "What really prompted my comeback, was to fulfill those. To hang some hardware around my neck," he told the New York Times. Born in Steamboat Springs, a Colorado resort, it was a convenient setting to begin his first experience on skis, encouraged by his three brothers. He won his first event in the Intercontinental Cup, the equivalent of the World Cup B circuit before moving up to the top circuit in December 1993. Growing in stature, he competed at the 1994 Olympics in Lillehammer and competed admirably finishing 13th in the individual event and seventh in the team competition. 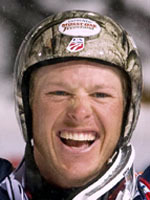 Then he won his first World Cup event in his home resort of Steamboat Springs, December 6, 1995. The 1998 Nagano Games were a disaster, languishing in 20th place, he however bounced back to finish the year fourth overall in the World Cup. The 2002 Games, which were held on American soil in Salt Lake, failed to inspire a strong performance. By the time he retired for the first time following Turin, he had six World Cup victories to his name but had never finished in the top ten at any world championships. But that all changed after almost 18 months on the sidelines. He refused a free ticket back into the US team and instead earned his place by winning three of four events on the Continental Cup circuit in December 2008. Then came his majestic showing at the 2009 world championships at Liberec when he won the 10km normal hill world gold. On top of that, he helped the US to their best ever performance at the world championships by winning the 10km mass start for an historic double. Now with fellow world champion Bill Demong, the US have their best ever chance to not only win a team medal but also take the individual honours that Lodwick craves.